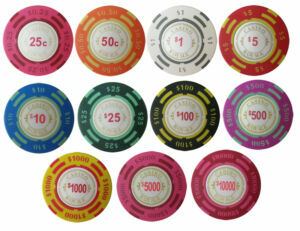 158 Paulson Poker Chips & Wooden Case ~ $1 Pharaoh’s Casino ~ Free Shipping! You’re bidding on: 158 Paulson Poker Chips and Wooden Case. The chips and case are the ones pictured. $1 Pharaoh’s Club & Casino (no cash value). FREE Shipping ~ USPS flat rate box Good Luck Bidding! CHIP ON PICTURES IS THE EXACT YOU WILL GET. Good condition. 1X Small Blind. 1X Big Blind. Material: Aluminum Plastic. 1X Aluminum Case. 1X instruction. 100 White, 100 Red, 100 Green, 100 Blue And 100 Black. This set include This set also include FREE accessories This set include the following denominations. Each chip weighs 11.5 grams. Net Weight: about 29 lbs. Easy to carry with an aluminum case. Suitable for both kids and adults to play. By buying this item you agree to these rules. QTY. 100 Paulson Pharaoh Poker Chips Black $100 denomination. QTY. 100 Paulson Pharaoh Poker Chips Black $100 denomination.. Condition is Used. Shipped with USPS Priority Mail. This is the original 14 Gram Ace Casino clay poker chip. The laser design with 4 aces around the graphic makes it a perfect chip for a casino party event! Mix or Match. Standard Breakout or Customize. The word "Casino" is written in between the two "A's.". This chip set is available in the following denominations. This chip set is available in the following denominations. Paulson chip rack not included. Vintage Catalox Poker Chips EUC. Condition is excellent. This page was last updated: Apr-21 02:09. Number of bids and bid amounts may be slightly out of date. See each listing for international shipping options and costs.